During a career covering eighteen years, I was lucky enough to ride the winners of a great many top jumping races. The Cheltenham Gold Cup, the Sweeps Hurdle, the Mackeson Gold Cup (twice), Victor Ludorum and Gloucester Hurdles, the Welsh National, the Grand Sefton at Aintree, the Triumph Hurdle — these were some of the good prizes that came my way. My greatest race, therefore, is not easy to pick out. At the moment of win­ning, I suppose, each and every one of them was a climax in itself, but looking back, I have to choose the 1967 Cheltenham Gold Cup, which I won on Wood­land Venture. Even if l had won the Grand National on Gay Trip — and we were beaten only two lengths by Well To Do in 1972 —I think I would still feel that the Gold Cup success was my greatest moment in racing. As a boy, my brother Tony and I used to sneak into Cheltenham without paying. We d jump over the fence by Frenchie Nicholson’s yard and spend the afternoon at the water jump. The National Hunt meeting was and is the most exciting racing of the season, and the Gold Cup the greatest prize for a horse and rider to win. I had turned professional and had been working for Fred Rimell for several seasons before I had my first good Gold Cup ride. Frank Cundell trained a good chaser called King’s Nephew, a horse normally ridden by Michael Scuda­more. For some reason, ‘Scu’ was unable to ride and he stuck me in for King’s Nephew. By coincidence, I had ridden my first winner over fences for Frank and I knew he would have King’s Nephew spot on for the Gold Cup. So it proved, for going down the hill with three fences to jump, I was only cantering with just two horses in front of me. Then, disaster. King’s Nephew stood off too far at the third last, hit the top and turned over. In between King’s Nephew and Woodland Venture five years later, only Sartorius springs to mind as a Gold Cup ride and he could hardly be taken seri­ously against Arkle and Dormant, in spite of trainer Barbara Lockhart-Smith’s optimism. Woodland Venture beat Fulke Walwyn’s Woodlawn by a head, and Fred, our previous conversation forgotten, was all smiles. I knew then that we had a really good horse. He could be a bit ignorant at his fences — walk through them if he was wrong – but if the jockey could sit on him he rarely fell. Now, of course, he had to be trained for the Gold Cup. Arkle was finished, Mill House was on the decline and the next best horse around was Stalbridge Colonist, who was certainly no better than our fellow. Fred ran Woodland Venture in the King George VI chase at Kempton Park at the end of 1966, and I truly believe we’d have beaten Dormant and Arkle but for falling at the second last. We were upsides Arkle at the time and on the bridle, but of course no one knew then that Arkle had smashed a bone in his foot. As Cheltenham approached, my confidence in Woodland Venture grew. I really believed he could win, for the Kempton form with Arkle had shown we were better than Mill House, who could not live with that great horse. There were eight runners for the Gold Cup. Mill House was favourite, of course, and David ‘Duke’ Nicholson was deputising for the injured Willie Robinson on him. I learned afterwards that Woodland Venture’s owner, farmer Harry Collins, had backed his horse early on, but wanting a few more quid on him had to take a barren cow to Yeovil market, without his wife know­ing, to get the extra cash to put on! Harry was standing with Fred and Mercy Rimell and travelling head lad Jack Kydd as I walked into the parade ring. ‘You know the horse, Terry,’ said theGuv’nor. ‘Ride him how you like-and be lucky!’ Down at the start, the usual chat. ‘You going on, Terry?’ ‘We’ll see how quick they go,’ and so on. Bill Cracknell, the starter’s assistant, went round checking the girths and then we were called in. Five fences later, Mill House fell. It was at the ditch at the top of the hill, and I had seen my stride, quickened, and gone for a long one. Half a length behind, it was too long for Mill House, and the last I saw of him was his forelegs by my left knee. I had a little laugh to myself. I hadn’t meant to get the Duke on the deck, but it’s one of the tricks of the trade if you can do it, and that was surely the biggest danger out of the way. Woodland Venture was still on the bridle and, rather than kick on, I hoped someone would come and join me. My horse was still a baby and he didn’t do a lot on his own. But either they couldn’t or they wouldn’t. I made up my mind to go on from the last bend, provided no one took me on going down the hill. We jumped the second last on the bridle and, coming to the bend, I said, ‘Come on, old fellow, you can win from here.’ Woodland Venture quickened, as I knew he would, and still there was no sign of the opposition. I had not looked round throughout the race and for all I knew there was nothing left standing. Our splendid isola­tion didn’t last long. Fifty yards from the last fence, a grey head appeared by my right elbow – about the worst sight I could have seen! 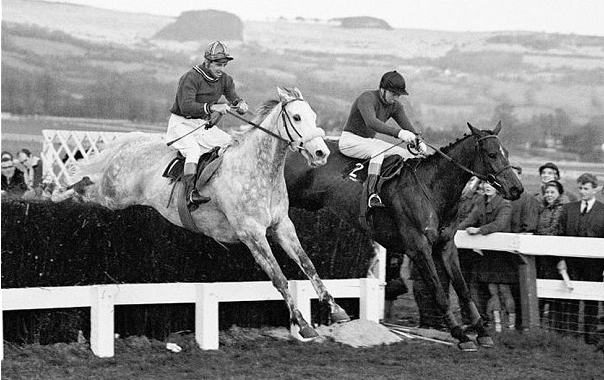 There was no mistak­ing Stalbridge Colonist, a horse who had beaten Arkle in the Hennessy Gold Cup four months earlier. And, worse, his rider, Stan Mellor, was the hardest man anywhere to beat from the last fence. Stan had timed his run to perfection and was just in front as we picked up to jump. He flew it and landed running, but Woodland Venture went into the bottom and, although he was never going to fall, he wasn’t as quickly away. Stan had half a length on me and all I could think was how hard it was going to be to beat him up the hill. Woodland responded immediately to my driving, however. I was using my whip in rhythm with his stride and he quickened magnificently. Within yards we were getting back the lost ground. I should explain something at this point that has never before appeared in print. Jumping the last fence, I had managed to lose the near-side rein and, with my stick in my right hand, the off-side rein was in my left hand! Anyone who rides will understand the situation I was in. I had to keep on riding and urging on Woodland Venture, but to give him maximum assistance I needed both reins to get hold of his head’. The only way I could even up the reins was to wind them round my fist as I rode-and although this all takes time to explain I don’t suppose we had gone a hundred yards before I had both reins together and the horse balanced. I knew then that we would win. Stalbridge Colonist had no foot; he’d been ridden to perfection, but my horse kept pulling out a bit more and we collared him fifty yards from the line. I felt marvellous as we pulled up. Stan came upsides, reached across and shook me by the hand. ‘Well done, you bugger’ he said, or something like that. The full force of what had happened came to me on the long walk back through the car park to unsaddle, and the welcome from the crowd round the unsaddling enclosure was deafening. At that moment I know I shed a tear, and I just can’t remember what Fred or Mercy said to me as I jumped off the old horse. 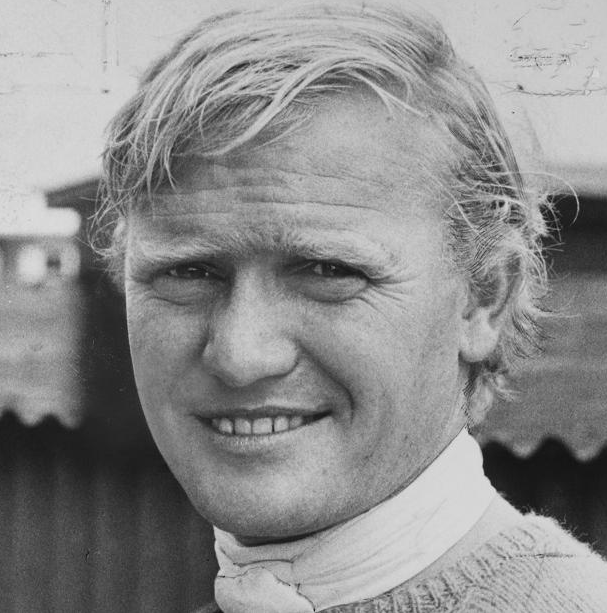 Of course, there was champagne in the dressing room, and when the races were over I went off to have a bottle or two with Josh Gifford and some of the boys at Prestbury. That made me late for dinner with the Rimells and Harry Collins, which didn’t go down too well. After dinner I played cards until the small hours, and in the morning I found I’d put on too much weight to ride for Ron Smyth at Lingfield. Josh had to phone him for me and Ron wasn’t too pleased. I’m sure he didn’t believe the story Josh told him-whatever it was-but he’d been a jockey himself and must have understood when he’d calmed down. Woodland Venture had his problems after this and never ran as well again, but the ride he gave me round Cheltenham that day in March will stay in my mind for as long as I live. ‹ PreviousHail Cue Card and a wonderful Betfair Chase! Next ›Should connections of coup horses’ rivals have withdrawn their runners? Wonderful recollections Joe and let’s face it when we grow older….that’s all we have. Hen must have had the patience of a saint, even though Terry had slowed down by then! A fabulous story, thanks so much for sharing it. I was just a lad at school when Terry won the GC, but I had a keen interest even as a young boy and remember telling my older sister’s boyfriend (who was a bit if a gambler) that he should have a few bob on Woodland Venture at Cheltenham.. he laughed thinking I knew nothing and backed the great Mill House instead..more fool him. Terry Biddlecombe was without doubt one if the greatest jockeys of his era and along with Stan Mellor, Josh Gifford, Pat Taffe, David Mould and possibly the best hurdles jockey to be seen. Jimmy Uttley, will hold the fondest of memories for me for the rest of my life. RIP Terry and keep riding those winners up there.